Lake Erie tributaries boast some of the best steelhead fishing in North America, mainly due to lakewide stocking that exceeds 1.7 million yearlings annually. The steelhead run this fall was spectacular, providing the best action in almost a decade. The good news is that more of the same is expected through Spring 2018. And while the recent cold weather has left most of the Lake Erie tributaries frozen, any warmup will open the streams back up and provide some of the best action of the entire season. Information on the current year's fishery is being collected through an ongoing angler survey, and results will be available by Fall 2018. 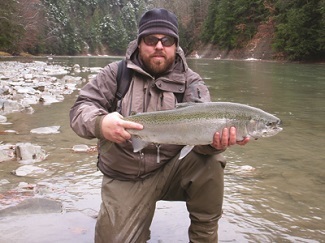 See DEC's website for additional information on New York’s Lake Erie steelhead fishery. In an effort to assess the status of the walleye population and other warmwater sportfish in Otsego County's 2000-acre Canadarago Lake, an electrofishing survey was conducted on November 2, 2017. Of primary concern was the lake’s walleye population, which has declined since alewives were illegally introduced to the lake. Alewives feast on walleye fry and can eliminate natural reproduction. Walleye are stocked annually in the lake in an attempt to boost the population. The survey noted good-sized distributions of largemouth bass, chain pickerel, yellow perch, bluegill, pumpkinseed and rock bass. Less common were smallmouth bass, walleye and tiger muskellunge. Despite the poor walleye return, stocking and assessment efforts will continue through 2020. Thanks to SUNY Cobleskill and SUNY Oneonta for providing electrofishing boats and staff to assist with the survey. The 2018-19 Freshwater Fishing Regulations Guide will be available to anglers in late February. 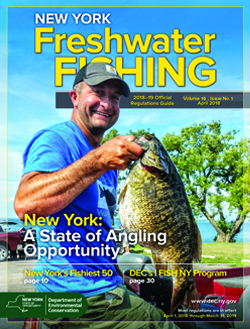 The new guide will focus on NY Fishing Opportunities and will have a feature article on the DEC I FISH NY program. You can obtain a copy at any DEC office or license-issuing agent. An online version will also be provided on the DEC website. New York resident and non-resident anglers should be on the lookout this winter for the New York State Angler Survey. The survey, last conducted in 2007, will be conducted primarily via email. Survey participants will be randomly selected from DEC records of 2017 license holders who provided a valid email address. The survey seeks information on fishing-related expenditures, preferences, and opinions on potential DEC actions to improve fishing and access to fishery resources. Your input is important to us, so if you receive a survey, please fill it out completely and return it as directed. New York's state fish, the brook trout, evolved with few competitors among fish species. 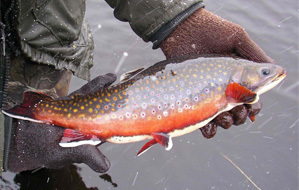 Unlike other trout and salmon species, fish are not a common or necessary component of a brook trout's diet. The introduction of non-native fish, usually via a bait bucket, is a major factor in the elimination of brook trout from a significant portion of its native range. Please be careful with the use of baitfish and never move fish from one water to another. It's illegal and can do more damage than you might think.